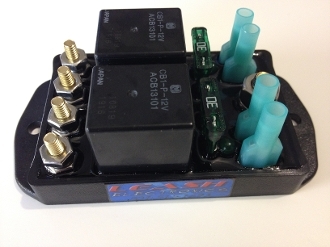 Features: 2 industrial 70 amp heavy duty relays. 1/4" main battery input stud, 2 #10 outputs studs and inputs use .187 female blade crimp terminals. Uses heavy duty J-case automotive fuses. Can be setup for positive or negative triggering. Has led's before and after fuse to diagnose blown fuses. Now potted and waterproof! !